Like this sort of stuff? You should also visit the D3 Gold Forums. 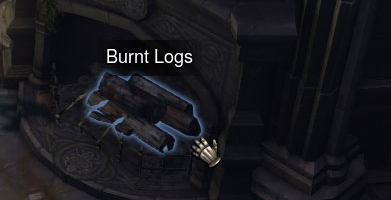 This charred piece of Leoric was clearly once connected to his ankle and knee. Leooric’s Shinbone is one of five materials needed to craft a Staff of Herding. All of the materials, the plans and the staff itself are ‘bind on pickup’ in the sense that they can not be traded with other players or bought and sold on the auction house. To find Leoric’s Shinbone, you will need to venture into Leoric’s Manor on any difficulty. This is at the end of Act I. To do this efficiently select the quest The Imprisoned Angel, immediately use Leoric’s Manor way point and look for the Fireplace. Check for a pile of Burnt Logs, these will open up like a chest and give you the Shinbone. If the Shinbone is not in the Fireplace then leave the game and immediately resume so that you’re put right back into Leoric’s Mannor. You will find that this is the fastest way to check to see if the Shinbone spawned in your game. Warning: Keep in mind that the Shinbone is not always there and we don’t know exactly what the spawn rate is. Some people have reported that it has taken as many as 30 resets or as few as zero. It’s luck, just keep rejoining, make sure you’re looking in the right spot and be patient. will the pile always be ther or only if shinebone is there? it took like 10times to farm for the bone to drop for me got like around 8000g 5-6 blues and 2 gold items. like the post says be patient. thier only be the 1 fireplace in ther too. so just keep restarting and you will get it. thanks for the site it helped. I got it on the 3rd try. the first two times there were no logs. Thank you so much for your excellent guide. when you enter the mannor you are in a long room, there is a door to the right, go in there and you’ll see the fire place. most of the time there is nothing in it. Subscribe to Diablo3Artisans and be the first to know about tips, exploits, tricks to making in game gold and real money in Diablo 3! Make Real Money in D3?